A native of Fallsburg near Louisa in Lawrence County, Kentucky, Paul E. Patton graduated from the University of Kentucky with a Bachelor of Science degree in mechanical engineering in 1959. After graduation he began his professional career in the mining industry in Floyd County . Over the next 20 years, he built a successful coal business and became a leader in the industry. He has been a member of the Board of Directors of the Kentucky Coal Association, member of the Kentucky Deep Mine Safety Commission and Chairman of the Board of the National Independent Coal Operators Association. In 1979 Patton embarked upon a new career path accepting the call of public service. In 1979 and 1980 he served briefly as the Deputy Secretary of the State Transportation Cabinet in the administration of Governor John Y. Brown, Jr. He also served as Chairman of the Kentucky Democratic Party from 1981 to 1983 at the request of Governor Brown. In 1981 he was elected County Judge Executive of Pike County , Kentucky where he served for 10 years. In that capacity he exhibited determined political leadership by successfully securing the adoption of the first universal mandatory county-wide solid waste collection program in Kentucky . He also earned a reputation as a no-nonsense public administrator, concentrating on the construction of rural roads, recreation facilities, county buildings, and economic development efforts. After losing a statewide race for Lieutenant Governor in 1987, Patton showed his grit by running for the same office in 1991, this time with resounding success. (His first political race was for a seat on the U.K. Student Government Association in 1956 which he also lost.) Governor Jones demonstrated his confidence in Patton by appointing him Secretary of Economic Development, making him the first Lieutenant Governor to serve in a Governor’s Cabinet. 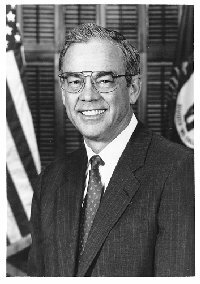 In that position he demonstrated his understanding of economic development by writing a book entitled “Kentucky’s Approach to Economic Development” and by spearheading a complete redesign of Kentucky economic development efforts, securing the adoption of four new economic development incentive programs and the establishment of the Kentucky Economic Development Partnership. Patton was elected as the state’s 59th governor in 1995, a race in which he was considered the underdog by most political pundits in the Commonwealth. He immediately set out to improve the economy and education in Kentucky, the two rails of that railroad he envisioned that would lead Kentucky to a brighter future. The passage of House Bill 1, the comprehensive restructuring of postsecondary education in Kentucky was the highlight of his eight years of service which saw Kentucky make significant progress on many fronts including worker’s compensation, juvenile justice, domestic violence and child abuse prevention, historic preservation, and infrastructure construction. As Governor he became a national leader, serving as Chairman of the Southern Regional Education Board, the Southern Growth Policy Board, the Education Commission of the States, the Appalachian Regional Commission, the President’s Commission on the High School Senior Year, the National Education Goals Panel, the Democratic Governor’s Association and the National Governor’s Association. He is in semi-retirement in Pikeville where he serves as a Distinguished Visiting Lecturer in Public Policy and Leadership. He is married to the former Judi Conway of Pikeville. They have four children: Nicki Patton, Chris Patton, Jan Harvey Johnson, Jr. and Bambi Todd. He is a member of the First Presbyterian Church of Pikeville, the Big Sandy Regional Economic Development Board and chairman of the Pikeville/Pike County Industrial and Economic Authority. He and Judi have been U.K. Fellows for many years.